Cloudy skies. Slight chance of a rain shower. High around 50F. Winds N at 10 to 20 mph..
A few clouds. Low 32F. Winds N at 10 to 15 mph. COLFAX/CHIPPEWA FALLS — Marjorie Annette St. Aubin, 98, of Colfax, formerly of Chippewa Falls died Thursday, March 21, 2019, at Colfax Health and Rehab while under the care of Heartland Hospice. 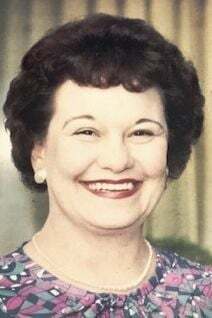 She was born Feb. 18, 1921, in Chippewa Falls, the daughter of Robert and Hilda (Christopherson) Sweeney. Marjorie was baptized as an infant and later confirmed at Faith Lutheran Church. She attended school in Chippewa Falls. Marjorie was united in marriage to Robert Madson and was blessed with one child. She then married Clyde St. Aubin, in 1946 and moved to Cornell. She worked outside of the home during World War II and was a homemaker. She enjoyed reading, fishing and helping her mother at Chippewa City Resort in Eagle Point. Marjorie is survived by her grandchildren, Mark (Mary) Madson of Hutchinson, Minn., Randy (Linda) Madson of Dassel, Minn., and Jackie Madson (Patty Richert) of Princeton, Minn.; daughter-in-law, Alice Madson of Hutchinson; nine great-grandchildren; nine great-great-grandchildren; and many nieces and nephews. She was preceded in death by her parents; son, James Madson; sister, Dolores (Lyle) Larson; and brother, Kenneth (Monica) Sweeney. A funeral service will be held at 11 a.m. Monday, April 15, at Pederson-Volker Funeral Chapel with the Rev. Robert B. Hoekstra officiating. Visitation will begin at 10 a.m. Monday at the funeral home. Pederson-Volker Funeral Chapel & Cremation Services, Chippewa Falls is serving the family. Please share your memories and condolences online at www.pedersonvolker.com.